(19580.1, Fort Sill Museum Collection, OHS). Food historians have said that trying to define barbecue is as difficult as "nailing jello to a tree" or "herding cats." Each of the four dominant barbecue regions (Carolinas, Texas, Memphis, and Kansas City) claim that their barbecue is the best, and aficionados believe they have found the best barbecue joint. "Barbecue" can be defined as a method of slow roasting over low heat, or as the food served with barbecue sauce, or as a social event at which barbecue is served. The cooking process can vary, depending on whether marinades or rubs (dry or wet) are applied and the type of wood (hickory, oak, pecan, mesquite) used to build the fire. Barbecue sauces are based on vinegar, mustard, or tomato and range from sweet to tangy, determined by the amount of brown sugar and vinegar added. To these variants add the influence of Africans, American Indians, and Europeans. Although humankind has been cooking meat over an open fire since prehistoric times, it is generally believed that the term barbecue originated from the Spanish word barbacoa. In the fifteen century barbacoa described the method of cooking used by the West Indies' Tianos, who cooked their meat on a green-wood framework over an open fire. Food historians claim that the first mention of barbecue in the United States is in colonial Virginia where a law forbade the shooting of firearms at a barbecue. Barbecue recipes appeared in colonial cookbooks of the southern seaboard from North Carolina to Georgia. Europeans introduced domesticated livestock to the Americas. The Spaniards introduced cattle and pigs to the West Indies, Florida, and Mexico during the fifteenth and sixteenth centuries. The English brought livestock to Jamestown, Virginia. Pigs proliferated, and consequently, pork and corn became staples in the Southern diet. During the colonial and antebellum eras African American male slaves predominantly dug the pits and tended the meat as it cooked over an open fire built from hickory or oak wood. Meanwhile, slave women prepared side dishes. In eastern North Carolina locals prefer "pulled" pork (pulled from the bone in chunks) with a spicy vinegar sauce (no tomato). Western North Carolinians and western Kentuckians eat barbecued mutton. Kentuckians like burgoo (a stew) served with their barbecue. South Carolinians serve barbecued pork with a mustard-based sauce and a side order of hash, and in Georgia, Brunswick stew is offered with barbecued pork and tomato-based sauce. In Memphis patrons eat "pig sandwiches" with coleslaw, but Texans prefer barbecued beef brisket. Kansas City offers a blend of the pork tradition of the South and the Texan preference for brisket. In Indian and Oklahoma territories barbecued meat, usually beef, was served at various social gatherings, including Juneteenth and July Fourth celebrations, church camp meetings, stomp dances, election days, and weddings. Beef probably dominated the meat choice because the Five Tribes raised livestock. The federal government issued beef to Plains Indians in western Oklahoma, and Oklahoma cattle trails connected Texas with cattle markets in Kansas. Occasionally barbecued pork, sheep, venison, buffalo, and bear would be served at group gatherings, and side dishes would include biscuits, Indian dishes, and lemonade. Although barbecued beef was the predominant choice in early Oklahoma, barbecued pork was designated as part of Oklahoma's Official State Meal in 1988. Generally, Oklahomans eat a variety of barbecued meats (beef, pork, hot links, chicken, and bologna) served with hot, or mild, tomato-based sauce. Coleslaw, baked beans, and potato salad washed down with hot coffee, iced tea, soft drink, or beer round out the meal. Added touches include dill pickles, sliced onion, and hot peppers. Pie is usually served for dessert. As in other states, political events usually created a reason to have a barbecue. At 1907 statehood celebrants at Gov. Charles N. Haskell's inauguration enjoyed barbecue in a Guthrie park. 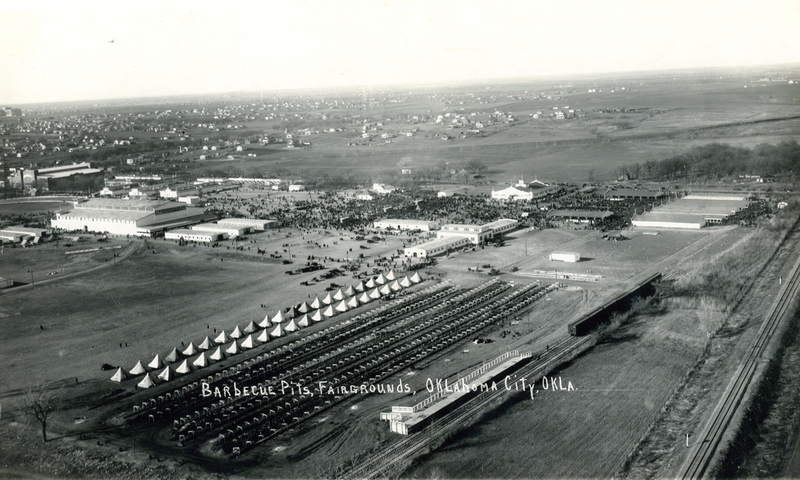 In 1923 Oklahomans feasted on fifteen varieties of meat barbecued at the State Fairgrounds in Oklahoma City during Gov. John Calloway "Jack" Walton's inaugural celebration. Oklahomans also like to serve barbecue at annual events. The Oklahoma Farmers' Union usually held an annual barbecue in August. The farming community of Morrison has held a barbecue at the end of July since rancher Calvin Pauley suggested it in 1976. At the Morrison barbecue, beef, pork, goat, and occasionally venison are cooked over a long, narrow pit fueled with wood from nearby elm and pecan trees. Recognizing gender-specific roles, the men tend the outdoor cooking while the women prepare the side dishes and desserts. In June 2000 the Cushing Chamber of Commerce and the local pipeline companies sponsored its fourth annual Bar-B-Que and Blues Festival. Hopeful competitors vie for a thousand-dollar grand prize and the state barbecue title at Oklahoma's only sanctioned Kansas City Barbecue Society smoke-off. By the 1930s pig stands and barbecue joints proliferated in Oklahoma towns. In Oklahoma City, Norman, and Capitol Hill, Marsh's Pig Stands served their "Juicy Pig Sandwich" on a special bun made by Colonial Bakery. In 1928 Leroy Vandegrift opened his first Pig Stand in Wewoka. Van's Pig Stand, established in 1930 in Shawnee, offered customers tender chunks of pork shoulder served with curlicue French fries or a twice-baked "Vanized" potato filled with garlicky sour cream. Van's Pig Stand has marketed its barbecue sauce and rub at local supermarkets. Oklahomans have produced more than a dozen barbecue sauces. They include Factory's Bar-B-Que made in Okmulgee, Cain's in Tahlequah, Bootleggers in Bartlesville, and Latimer's and Martin's in Tulsa. Hillbilly is made in Sapulpa. Donovan Fred Head developed Head Country Bar-B-Que Sauce in 1945 after serving as a cook in the U.S. Navy during World War II. He sold the recipe to his nephew Danny Head in 1977. Originally sold in feed stores in Osage County, the product is sold in grocery stores in Oklahoma and West Texas. In Ponca City the Head Country Bar-B-Q Restaurant offers ribs, brisket, turkey, chicken, ham, and hot links to Oklahomans and to Kansans who trek across the state line. Head Country barbecue teams have won numerous state and regional competitions as well as a world championship in 1994. Ingenious marketing ideas have combined Oklahoma football and barbecue. The Selmon brothers of University of Oklahoma football fame sold Selmon Brothers Bar-B-Que sauce from Norman, home of the OU Sooners. Hot Harry's Sauce offered a separate label for Oklahoma Sooner Barbecue Sauce and Oklahoma Cowboy Barbecue Sauce for respective fans to serve at their university tailgate parties. In conjunction with the usual rivalry between Oklahoma Sooner and Texas Longhorn football fans, in 1994 former Oklahoma Gov. Frank Keating and former Texas Gov. George W. Bush made a bet on the OU–Texas football game. The loser would host a barbecue for the winner. In 1995 the teams tied. However, in 1996 OU beat Texas (30 to 27 in overtime). Bush had to make good the bet, and on March 22, 1997, in Altus, Oklahoma, thousands of fans ate fifteen hundred pounds of beef brisket donated by a Texas rancher and prepared by Jake's Rib and Hickey's Barbecue, both of Chickasha, Oklahoma. At the turn of the twenty-first century Leo's, located in a former gas station in Oklahoma City, offered barbecued ribs, beef brisket, hot links, and bologna prepared in the pits formerly used by automobile mechanics. Side orders included baked beans and potato salad with banana strawberry cake for dessert. Alonzo "Slick" Smith, who established Slick's Bar-B-Que in 1941 in Muskogee, continued to offer brisket and ribs prepared over hickory wood and served with white bread and a chunk of onion on waxed paper. Further east in Sallisaw, customers enjoyed the pork ribs and beans served at the Wild Horse Mountain Bar-B-Que. Although people joke about determining the best barbecue joint by the number of pickup trucks and Mercedes cars in the parking lot, it is no joke that good barbecue draws Oklahomans together to enjoy one of their favorite southern foods. In the South, "Barbecue is more than a meal, it's a way of life." Bert Feintuch, "Geography of Foodways," in Encyclopedia of Southern Culture, ed. Charles Reagan Wilson and William Ferris (Chapel Hill: University of North Carolina Press, 1989). Gary D. Ford, "Barbecue," in Encyclopedia of Southern Culture, ed. Charles Reagan Wilson and William Ferris (Chapel Hill: University of North Carolina Press, 1989). Dotty Griffith, Celebrating Barbecue: The Ultimate Guide to America's Four Regional Styles of Cue (New York City: Simon and Schuster, 2002). Robert Henry, "Van's Pig Stand," Oklahoma Today 50 (January–February 2000). Theodore C. Humphrey, "'It's a Community Deal Here, You Know": Festive Community Life in Rural Oklahoma,'" in "We Gather Together": Food and Festival in American Life, ed. Theodore C. Humphrey and Lin T. Humphrey (Ann Arbor, Mich.: University of Michigan, 1988). Michael Wallis, "Sniffing Out the Best 'Que,'" Oklahoma Today (January–February 1989). Linda D. Wilson, "Barbecue," The Encyclopedia of Oklahoma History and Culture, https://www.okhistory.org/publications/enc/entry.php?entry=BA017.